A spiritual awakening means something different to everyone, one common understanding of it is simply believing in more than just yourself. For some, it’s trusting your gut or intuition more. And for others, it’s even deeper – to begin to look past the physical limitations of this reality, and focus on going within to connect to what some call God, Source, Higher self, etc. 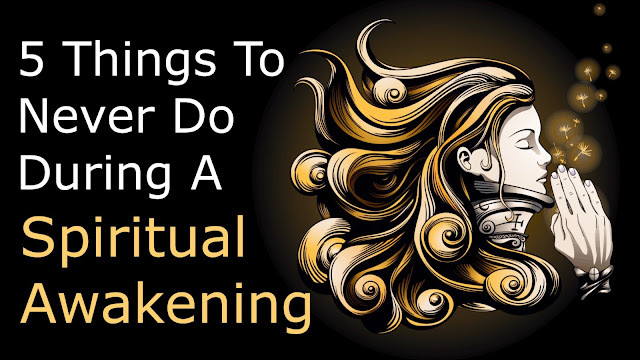 A spiritual awakening can lead one down a road to higher understanding of themselves and their placement within this crazy world, and for many, they couldn’t imagine their lives without faith in something being the centerpiece. However, along this road toward enlightenment, inner peace, greater understanding, or whatever you’d like to achieve, you might find yourself getting lost along the way. This is perfectly normal, of course, but please try to stray away from the following things that will only hinder your growth. 1. STAYING STUCK IN THE PAST OR FUTURE. One common facet of spirituality is focusing on mindfulness, or being fully aware of the present moment. However, we cannot do that if we remain entrenched in the past or future. If we focus too much on times already gone or times not even here yet, we will wreak havoc on our inner peace. To gain inner peace, we must fully let go and embrace the present. So, on your spiritual journey, we hope you will remember to lose yourself in the moment you have right now, and forget about moments gone or moments that haven’t yet arrived. Much of spirituality lies in going with the flow and not trying to control your surroundings, anyway. 2. BEING TOO HARD ON YOURSELF. Along this path, you might find yourself being hyperaware of your own thoughts and actions, so much so that you start to judge yourself too harshly. While being conscious of the self is a big part of spirituality, you have to learn to simply watch yourself as a mindful observer, and not judge what you might hear or see. We live in a very judgmental world, but you have to learn to let go of these man-made judgements and pre-conceived ideas of who and what you should be. Your spiritual journey should not be about achieving perfection; rather, it should be about learning to love yourself IN SPITE of those imperfections that make you, you. Don’t believe what anyone else tells you about spirituality – it’s your own personal journey, and no one can tell you how to traverse it but you. 3. FEELING GUILTY ABOUT HOW YOU LIVE YOUR LIFE. When you start to delve deeper into your spiritual awakening, you might find that your ideals and morals have changed a bit. Thus, you find yourself at odds with certain people in your life, because they have gotten so used to the old you that they don’t really know how to deal with the “new” you. Of course, this is the natural course of life, as people change and find what makes them happy. However, don’t feel guilty about your life just because it doesn’t click with those around you. Maybe in your spiritual journey, you’ve found that you want to simplify your life, and live off-the-grid to get closer to nature, God, or whatever you call the center of your spirituality. If this makes your heart happy, you have to follow it, regardless of what others may think. You have to live your life for you, not for others. 4. COMPARING YOURSELF WITH OTHERS. This sort of goes along with the previous point – don’t ever judge yourself against other people. You will either disappoint yourself, or allow your ego to become inflated. Neither of these things will help you in your spiritual journey; rather, they will hinder you. Your spiritual journey is highly personal, and totally unique to you. Therefore, it’s both unwise and irrational to compare yourself to others, because you have to move at your own pace in life. Someone might seem more spiritually advanced than you, but who’s really to say? Only you can judge yourself at the end of the day, so make sure to simply focus on your own life and do what you have to in order to feel fulfilled within yourself. 5. NOT ALLOWING YOURSELF TO FEEL EMOTIONS. A common belief you’ll come across in your spiritual path is that we should strive to not let our emotions overpower us, instead becoming the watchful observer of our thoughts and feelings. However, this doesn’t mean to stifle your emotions so that you become a ticking time bomb. If you don’t deal with your emotions, you’ll have to later, and they will only gain strength from being bottled up for so long. Say what you need to say, feel what you need to feel. No apologies, and no feeling guilty. We are all human, and therefore have a wide spectrum of emotions. In order to feel alive, we must deal with how we feel now, and not bury our emotions just because we don’t want to face them.